Traditional phoenix design expressed with mother of pearl creates wonderful harmony with modern beauty from metal on this stylish tie clip and cufflinks, adding refinement to men's formalwear. The phoenix (bonghwang), along with the dragon, is the symbol of an emperor and is believed to herald a time of peace and prosperity. 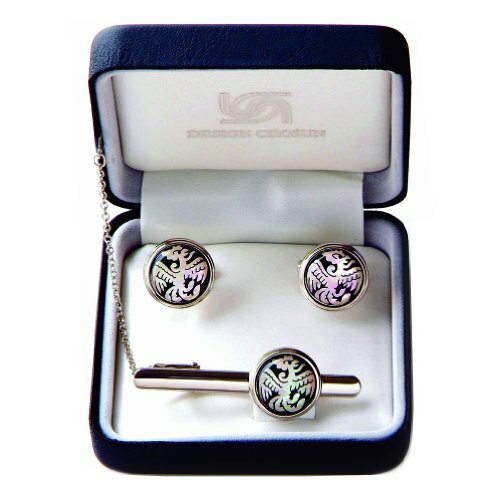 Unlike other machine-cut printed mother of pearl designs, the mother of pearl designs on this unique tie clip and cufflinks, which are delicately jigsaw-cut by hands, are individually inlaid by our skilled artisan as shown in the large picture. If you have any questions about this product by Antique Alive, contact us by completing and submitting the form below. If you are looking for a specif part number, please include it with your message.